In artist and poet talks, Gwendolyn Morgan, Clark County’s newest Poet Laureate (2018-2020) often invites each person to consider: How are you sharing your gifts in the world? After the “passing of the pen” from Clark County’s Inaugural Poet Laureate Christopher Luna (2013-2017) to Morgan last fall at a public celebration, the poet and visual artist’s vision is to continue to lift up the poetic voices in our community from diverse socio-economic backgrounds that have not been heard. Through community outreach, she hopes to find more poets and writers who are quietly writing in their own homes and said she would like to see poetry in various languages presented in community venues. Morgan demonstrates by example and encouragement the art of language as a powerful means of self-expression. Her first book of poems Crow Feathers, Red Ochre, Green Tea, 2013, was a winner of the Wild Earth Poetry Prize, Hiraeth Press. Snowy Owls, Egrets and Unexpected Graces has been named as a 2017 Foreword INDIES Book of the Year Awards Finalist in the Nature Category and Nautilus Book Award Winner, Gold in Poetry. She holds an M.F.A. in Creative Writing from Goddard College and M.Div. from San Francisco Theological Seminary and the Graduate Theological Union, and currently serves as Manager of Spiritual Care at Legacy Salmon Creek Medical Center. Another personal goal Morgan has is to have rescue animals and therapeutic animals included in her community outreach. Clark County Poetry Pop-up is a “program supported, in part, by a grant from the Washington State Arts Commission,” said Morgan. This year Morgan has been invited to assist with county literary events that include Poetry Out Loud, Ridgefield and Washougal Youth Arts Month, and the State of the City, Vancouver. She said she is also looking forward to being one of the judges this spring for student poems for Artstra’s Poetry Moves Program and a student-led poetry contest at Heritage High School. “I am also graced to have met Claudia Castro Luna, our Washington State Poet Laureate, who is working on a statewide Poetic Routes of Washington project, and will be honored to support her in her projects,” said Morgan. “I encourage everyone to hear her read at the Community Library, Thursday, April 11, as a part of Ghost Town and supported by Clark County Arts Commission.” Morgan added she has been supporting Castro Luna in offering a Spanish poetry workshop for Latinx and indigenous native speakers at the Vancouver Community Library happening in June. Other June outreach includes, “Following the Tracks of Our Wild Selves: Poetry & Art-Making Along the River,” a collaborative workshop community Morgan and her colleagues are offering at TreeSong Nature Awareness and Retreat Center also in June. Morgan said Magenta Theatre will host a Friday, June 28 collaborative event with Washington Dance Creative and community musicians as a part of a Summer Solstice book launch for Before the Sun Rises, Morgan’s third book of poetry. This event will be an opportunity for the community to support artists in the community. Morgan’s book will be available at the event, through Homebound Publications, or at Vintage Books, a local indie bookstore. Writing since she was in elementary school, Morgan has a deep passion for her creative life. As an adult, Morgan said she imagined painting realistic images of animals and of the natural world. In spite of this, her whimsical storybook birds and animals have emerged again and again. Morgan said she takes time each day for creativity and lives life to its fullest with gratitude. 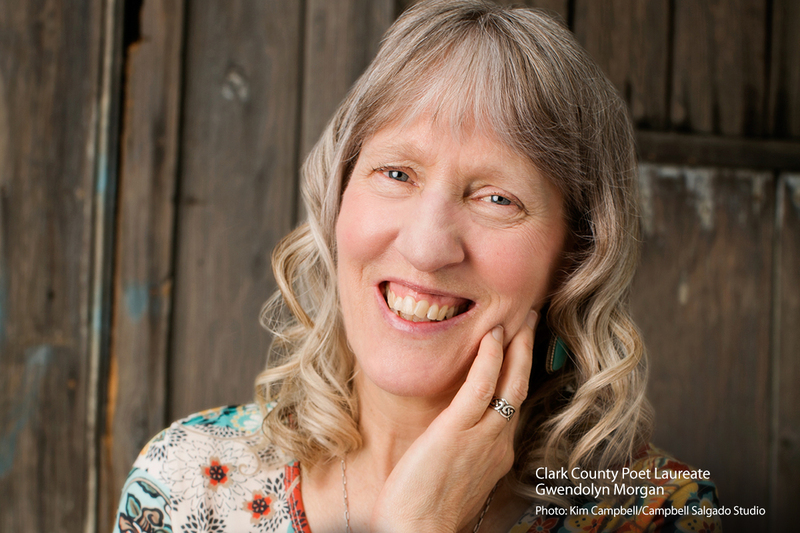 Great article about our Clark County Poet Laureate, Gwendolyn Morgan, who has brought her love and understanding of the natural world to the forefront of her poetry. Gwen is a tireless advocate for the unheard voices among us. Her presence and poetry encourage each of us to accept ourselves and the gifts we bring to the world. Gwendolyn Morgan embraces humanity, all living creatures…indeed our world with an eye for keen observation, a heart of loving kindness and compassion, and a poetic voice that is relevant today. Thank you very much for spotlighting her generous outreach in our community as our Clark County Poet Laureate.